CCNA RSE Lab: 3.2.1.9 Configuring Basic RIPv2 Topology Addressing Table Objectives Part 1: Build the Network and Configure Basic Device Settings Part 2: Configure and Verify RIPv2 Routing Configure RIPv2 on the routers and verify that it is running. 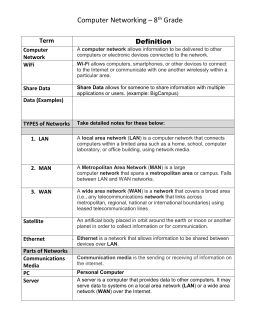 Configure a …... About This Lab Manual Switched Networks Lab Manual contains all the labs and class activities from the Cisco Networking Academy course of the same name. Lab - Configuring Basic DHCPv4 on a Router. Topology Addressing Table Device Interface IP Address Subnet Mask Default Gateway... Basic switch administration should be mastered by a switch administrator. This This includes familiarity with the hardware as well as basic port configuration. 9.3.2.13 Lab - Configuring and Verifying Extended 9.2.3.4 Lab - Configuring and Verifying VTY Restri... 9.2.2.7 Lab - Configuring and Verifying Standard A...... Basic switch administration should be mastered by a switch administrator. This This includes familiarity with the hardware as well as basic port configuration. Lab – Configuring Basic DHCPv4 on a Switch Verify DHCPv4 and connectivity. Part 5: Enable IP Routing Enable IP routing on the switch. Create static routes. Background / Scenario A Cisco 2960 switch can function as a DHCPv4 server.... Describes the architecture, components, and operations of routers and switches in a small network. Students learn how to configure a router and a switch for basic functionality. Describes the architecture, components, and operations of routers and switches in a small network. Students learn how to configure a router and a switch for basic functionality. from the device to answer questions about the router. In Part 4, you will configure IPv6 on the router so that In Part 4, you will configure IPv6 on the router so that PC-B can acquire an IP address and then verify connectivity. In this lab, you will configure DHCPv4 for both single and multiple VLANs on a Cisco 2960 switch, enable routing on the switch to allow for communication between VLANs, and add static routes to allow for communication between all hosts.